Photo: A girl walk to lay flowers on a wall at the Botanical Gardens in Christchurch, New Zealand, Sunday, March 17, 2019. 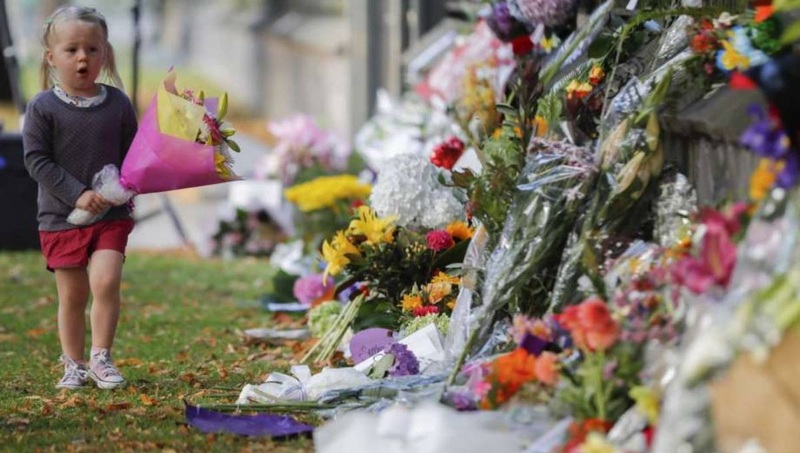 Christchurch, Mar 17 : Anguished relatives were anxiously waiting Sunday for authorities to release the remains of those who were killed in terror attack at two mosques in the New Zealand city of Christchurch, while police announced the death toll from the racist attacks had risen to 50. Islamic law calls for bodies to be cleansed and buried as soon as possible after death, usually within 24 hours. But two days after the worst terrorist attack in the country’s modern history, relatives remained unsure when they would be able to bury their loved ones. Prime Minister Jacinda Ardern said a small number of bodies would start being released to families Sunday evening, and authorities hoped to release all the bodies by Wednesday. Thirty-four injured victims remained at Christchurch Hospital, where officials said 12 were in critical condition. And a 4-year-old girl at a children’s hospital in Auckland was also listed as critical. At a news conference Sunday, the prime minister reiterated her promise that there will be changes to the country’s gun laws. She said her Cabinet will discuss the policy details on Monday.